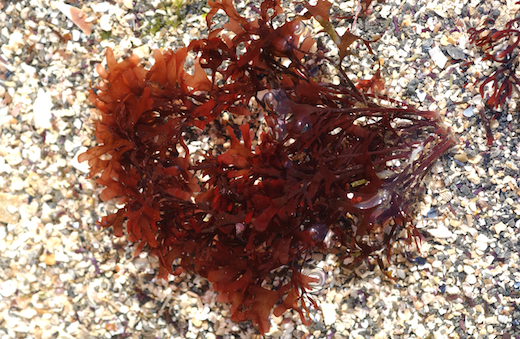 Description: Cartilaginous, purplish or reddish-brown fronds, to 100 mm high, with narrow, cylindrical, irregularly dichotomously branched stipes arising from small discoid holdfasts and expanding into flat fan-shaped laminae. Habitat: Shady sides of pools in lower intertidal and on rock subtidally. Widely distributed, frequent. Similar species: Phyllophora sicula, formerly P. palmettoides, is a “southern” species that occurs very rarely on rock in the extreme lower intertidal in S and W Ireland and SW England; its fronds are less divided and arise in clusters from a thin, expanded, discoid base. Site © M.D. Guiry 2000 - 2019. Important copyright notice: all text, design and photographs on this site are copyrighted by M.D. Guiry unless otherwise stated and all rights are strictly reserved. Click here for copyright information and contact. Website design: 249 Design Studio. Site maintained by M.D. Guiry (michael.guiry@nuigalway.ie). There have been 8736587 page loads since 1 January 2014 on 25 April 2019.